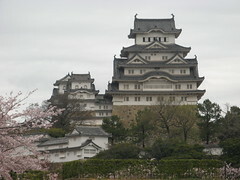 Himeji Castle (a.k.a. the White Heron Castle) is quite a sight. And quite a departure from the bright red and dark brown I’ve seen in Japanese structures so far. It sits on a hill looking over the plains and though I don’t know if it ever had to withstand attack it certainly has a great defensive position. It was rebuilt/restored in 1955 so I’m not sure how much of what I saw was genuine ancient stuff but it was impressive any way. 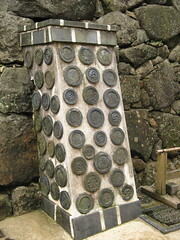 I especially liked the pillar featuring the family crests of all the lords of the castle. Over the years they each repair/extended the buildings and their crests went on the tiles they replaced. From Himeji we bullet trained to Hiroshima to our final hostel, J-Hoppers. It’s warm and cozy and it just feels right. If you want recommendations on hostels similar to the european style J-Hoppers and K’s Hostels are great. On the tram ride across town I swear I heard the announcer say “this street-car is bound forever”. I don’t know why they said it, but they did. We’ve walked around a bit but tried not to see the memorial stuff. We’ll do that on Saturday. Doing it now would really knock the wind out of our enthusiasm which has only just got back to speed after Kyoto. Himeji castle could be Japan’s Neuschwanstein. It provides a perfect postcard image.